This offering displeases me! I shall sentence Paradoxx to an eternity of suffering! La Vasca Se Mueve is, again, very formulaic. This song slows it down but maintains the cheesy europop bouquet, including some speaking in Spanish and sprinkles of that special muttering-shouting unique to the intoxicated. Perhaps the charm of this song is lost in translation, but at least it gets closer to being dark than other tracks could. Apocalypse Backwards, a track that is finally a bit creepy, only lasts ten seconds. It is just a clip of some speech and music played backwards to bring the satanic theme back in. In Le Tierra Ya Destruida, those drunken shouting-muttering vocals are back, singing some other cryptic message in Spanish. The beat is approaching what could be called dark, but the music is still very cheesy. The song calms in the middle for female vocals and a more angelic contrast, which makes things interesting, then loses either paradisiacal or demonic connotations and just continues to be corny. One phrase I caught of the lyrics was "no me interessa", and that is exactly how I feel about this theme of shouting as though you are intoxicated. Paradoxx, the title track, has everything that makes this album annoying. Rap music, sounds ripped from the Action 52 theme song, an annoying high voice. The beat isn't as formulaically europop, and though they do say the title in the song, no one is shouting it drunkenly, so they didn't manage to condense all the obnoxious traits of this album onto one track. It's sort of sad they even failed at doing that. ...This is when I realized there were seven more tracks... maybe this album is more satanic than I realised because I am beginning to feel like I am being punished for an eternity. Thankfully, Los Ninos Del Demonio was actually an enjoyable track and a refreshing break. While this song might not be very satanic, it has a lot of bounce and in conjunction with some cool distortion and funky synth, it manages to have a very disco-esque feel. Again, it would be better without the repetitive vocals, but I can say even with them that I would dance to this song. The Demon Attacks is basically a short monologue about evil. The music is very minimal and sounds a lot like the soundtrack from a vintage science fiction movie. Again it brings the album back to the satanic theme, which is good because the music certainly isn't doing the job. If the use of the words repetitive and formulaic is becoming ironic, please forgive me. At the very least, Diablo is funky and upbeat, but it doesn't explore very much new territory and overuses what it has covered. This is definitely the kind of song you would expect to hear in clubs where people where garden hose in their hair. To summarize, I find it very cliché. El Fuego again returns to the Action 52 sound effects with a bouncy beat. It is difficult to give these songs enough credit, since I have been listening to an hour of the exact same music every time, but I think it is safe to say that 666 is not a band that could be praised for its experimentation or fresh sound. At least in the middle there is a brief breakdown with a hip '80s sound to it. It's very difficult to imagine Satan rising from hell to consume the world to music not dissimilar to that of Crazy Frog. I'm Your Nitemare begins with some actually alarming dialogue with lots of echoing effects. Perhaps the dialogue has a greater effect on me this time because it takes place in English. The rolling beat and flute-like melody sound somewhat dream-like, but I am still not getting the dark feeling I am looking for. This feels more like the sort of song I might listen to while at the gym than a really gripping, horrifying piece. 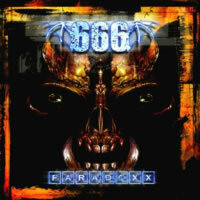 The 666 Megamix seems to be taking aspects from many different songs and tying them together, which isn't hard because they all sound so similar. The bubbly sound and the alarm can be heard from Alarma, as well as the shouting from Alarma, Los Ninos Del Demonio, and Diablo. There are many other sounds borrowed from different songs and it is interesting to see all of them patched together. I actually enjoyed this song somewhat because it is upbeat and changes often, but it really is a testament to how much overlap there is between all the tracks on this album. In Apocalyse Forwards, we finally get to hear what was encrypted in the backwards message of the other track: "Anyone who has intelligence may interpret the number of the beast. It's a man's number. This number is six six six." So since we have heard 666's interpretation, I have to say I am unimpressed. As a disclaimer, I understand that many bands that write albums about Satan are not taking themselves seriously and are creating a parody, so I needn't take the satanic sound so seriously, but this album takes it to the point where is doesn't even make sense to involve satanic imagery. If I wanted to parody satanic music, I might hyperbolize the satanic elements until they seem absurd as some metal bands have done, or juxtapose the theme with its opposite, by coming up with something crazy like a satanic J-Pop band, but I feel like what 666 did didn't take either of these directions and therefore doesn't make sense. It would be like Saturday Night Live making a parody of an election by going on a picnic. It can't be satire if it is irrelevant. Furthermore, not only was the album not very satanic, it was also cheap in terms of aesthetic experience. I found every track on the album to be cliché and unengaging except two, and I find that very disappointing. The only thing hellish about this album was the music itself.